Interview: The Tiny Paradise of Rebecca M. J. Hymes, Miniaturist. 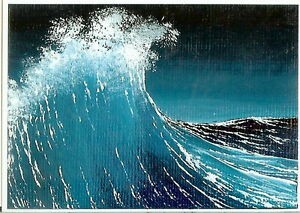 Rebecca M. J. Hymes is a painter of miniature masterworks, an international artist with a special flair for ocean scenes that capture the depth and motion of water. Much of her work measures only 1 x 1.5 inches — perfect for installing in a dollhouse, but just as popular for collectors who hang these paintings like tiny jewels on their walls. Working in acrylic on artist’s paper, she achieves a realistic effect nearly impossible on any scale. 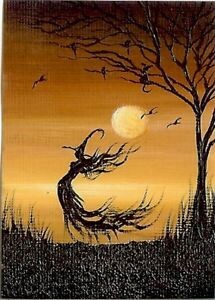 She also produces more fantastical images of witches, fairies, and gothic settings. Tiny masterpieces fit easily in the palm of one hand. Born in England, Rebecca studied fine arts and design at Selhurst Tertiary Centre, Croydon College, and Epsom College, before marrying an American serviceman and moving to Orlando, Florida. They have six children together. Rebecca is also living with severe glaucoma and cataracts. Despite visual impairment, her art has kept her going through rough times. It has helped not only Rebecca but also some of her clients deal with their own disabilities. To date, she has sold over eight thousand tiny artworks — yes, 8,000 — all over the world, as both original paintings and ACEO prints. Full disclosure: Our editorial director, Susann Cokal, owns several of Rebecca’s pieces. So it was natural that Susann conducted this interview in November 2018. 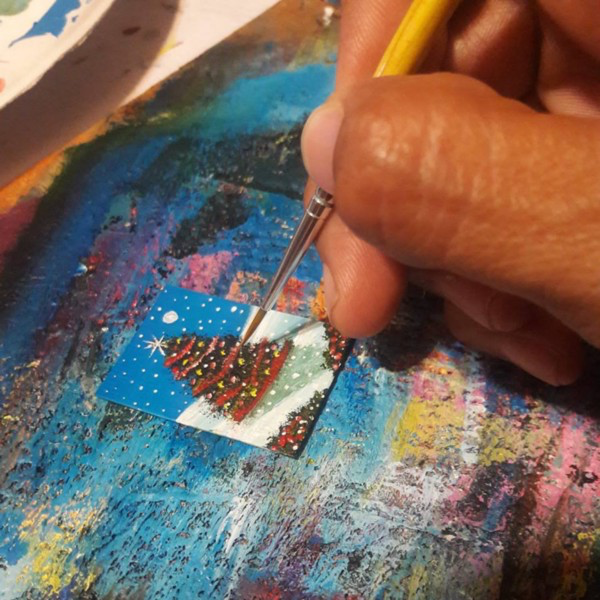 Small paintings bring partial cures to their creator and her clients. Broad Street: Rebecca, thank you for talking to us! As I mentioned, the theme with which this interview will be connected is “Small Things, Partial Cures.” The print issue of the magazine came out in June and featured a number of essays and poems on illness, along with images of the miniature and writings about the significance of tiny things. Your work and your life story put the two themes together — miniatures as a partial cure for your own illness. Could you talk about how they’re related for you? Rebecca: You know, I really believe that when the body is in pain — whether it is physically, emotionally, or mentally — we become our most creative. Our imagination is definitely intensified. 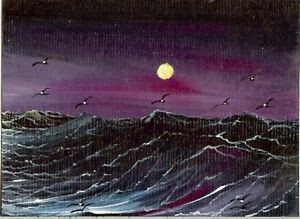 Above: A full moon shines over the sea, 1 x 1.5 inches at a time. A lot of my art comes from my subconcious mind. I have always been a dreamer; I usually have three or four dreams a night and can remember most of them. Sometimes I wake up in the middle of the night and have to note ideas down because I have had a dream of something so interesting I want to capture it before I forget. Some of my deeper paintings have been created when I have gone through mental or physical pain. How did you come to work on a miniature scale? 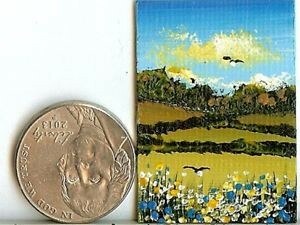 A nickel shows the scale of this 1 x 1.5 inch landscape. 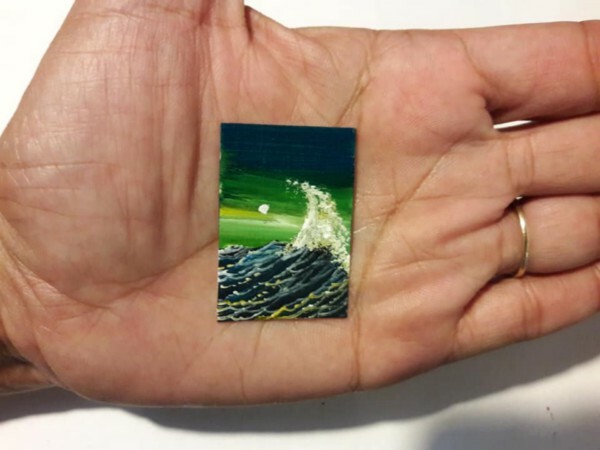 Miniature art has always been a fascination to me. I find it a challenge to squeeze detail into a teeny-tiny area. For a moment, I can forget about the brutal reality of a harsh world and hide in the little new world that I have created. It may be brief, it may be temporary, but it is satisfying and comforting. I remember that at college, I would often get told off for spending so much time on little areas of a piece. I also remember a teacher watching me drawing with a biro pen. To others he seemed strict and a little scary, but he looked at my pen art and told me, “One day you will really make something of yourself!” I will never forget it. And his prophecy came true! The miniature scale makes such a fun and interesting little world. I enjoy looking at little figures and figurines too. They are fascinating. I used to be spooked easily as a child, but when I started reading books by Enid Blyton (The Faraway Treeseries), I became intrigued by the fairies and fantasy creatures. Then I started collecting comics and spooky little figures. I suppose that was an early sign that I would become a miniaturist. 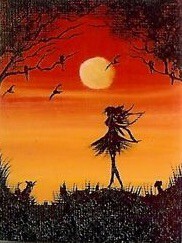 Seasonal paintings are very popular. This witch is 1.5 x 2 inches. What can you tell us about the materials you use? What do you find best for miniature work? I paint in acrylic because it dries super quickly. That way I can work on several paintings at one time, or I can complete something in fifteen or twenty minutes or so. It’s an advantage over oils, which you have to let dry for longer. Also, with acrylics I find the colors a lot more vibrant than, say, with watercolors. At work on a tiny Christmas scene. I use heavyweight acrylic paper; it holds the paint well and has a little texture to it, but it still remains relatively light, unlike a canvas board. I notice you paint the full moon quite often — it’s sort of a signature to your work. Is that because it’s pretty or is there some more complicated reason? 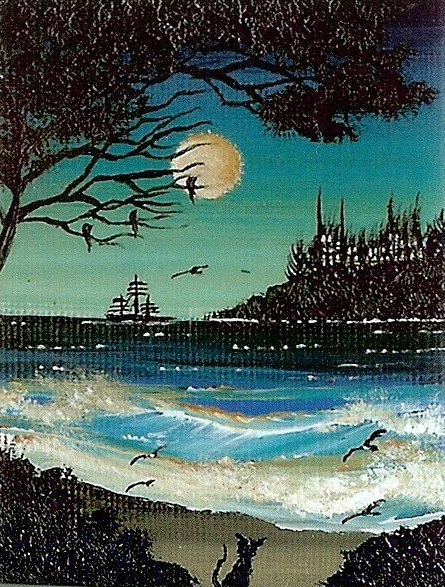 I mostly use the full moon’ to lighten up my gothic and fantasy paintings. 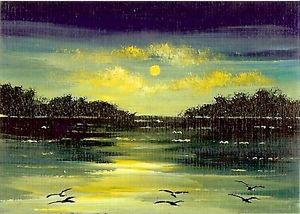 Sometimes I add grayish clouds with the moon shining through to illuminate an otherwise dark piece of art. The full moon also adds a little fun, spooky feel. They do say weird and wonderful things happen at a full moon. Now for a question we ask everybody — a question that gets more and more important these days: What do you consider truth in art to be? I really feel Truth in art can be interpreted differently, depending on the person. My art is based mostly on my dreams and thoughts. Although my work is perceived as maybe realism of some kind, my ideas, my colors, my shapes, the seascapes, and the landscapes are from my unconcious, sleeping, dreaming mind. My deepest thoughts, fears, imagination. The raw and bare truth which is buried deep within and expressed to the best of my ability through my art. Above: Rebecca is known for capturing realistic effects of ocean and light. How much do you think consciously of depicting reality, or at least conveying an impression of the “real,” as you paint ? I believe that when I begin to paint, I do start off with ideas of capturing reality. 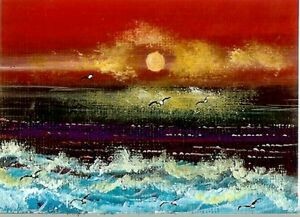 A beautiful scene that has inspired me, a sunset beach I have dreamed of … but then the imagination takes control and I switch directions to a completely different idea from what originally was intended. 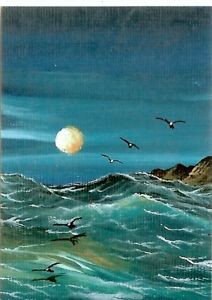 Even a more realistic seascape becomes a little cartoonlike, with intricate details of the white sea foam or an exaggerated coloring in a sunset sky. Sometimes I feel my art is a combination of tiny realism with a dash of impressionism. You have an impressive background in the fine arts, including prestigious schools in your native England. What do you feel were some of the most significant lessons you learned in your formal training, and who or what taught you those lessons? I have been blessed to have amazing teachers and to attend great schools. I learned so much, but most important was learning to have confidence in myself. When I was little, I would often travel with my grandma — I call her Mom; my biological mom gave me up when she was sixteen — who raised me all over England. We went to Norfolk, Hastings, Portsmouth, so many places for our vacations. We would take photos for me to sketch from. My teachers sometimes saw something in me I could not quite accept and believe for myself for a long time. I remember fondly one of my professors introducing me to impressionism. I had never dabbled in that style before, but the painting I created using impressionist techniques was quite interesting in a weird and colorful way. My teacher said that if he was able, he would actually purchase that piece. That was the first time I ever felt I could actually create something that could sell professionally. Above: This impressionist lakescape measures 1 x 1.5 inches. Wonderful! So then let’s discuss your turn toward the miniature. As I told you when I first encountered your work, I am fascinated by the effects you achieve, especially on such a small scale. When I see miniatures done well, I get an eerie out-of-body sensation, as if I don’t know my own size. So … What about the miniature scale appeals to you, Rebecca? Does it evoke any special feelings that keep you coming back? It is all about escaping large-scale reality, finding your own itty-bitty paradise in a teeny-tiny painting. Your own paradise. A little world of fun and weirdness where you become childlike again. How do you find your technique and style changing as you shift from a large scale to a tiny one? How easy is it to transition back and forth? I really don’t paint on a large scale often. I don’t enjoy it as much. I tend to get frustrated because I want to pack the detail in and it takes forever to finish a large piece. I have unfinished large pieces everywhere. Do you have a sense of what draws other people to your work? 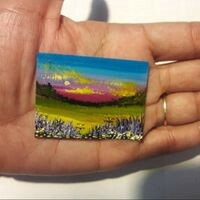 My personal miniatures give me a childlike, happy feeling as I create and look at them. Many of my collectors tell me they feel the same. Although about half of them collect for their dollhouses, the other half love the fantasy pieces and hang them on the walls of their own homes. Several parents of children with autism have written to tell me their children adore my art. I have asked why, and it seems the children are drawn to the vibrant colors and playful feel. One woman a while back told me her daughter had cancer and was going through a really tough time, but the two of them would spend time looking at my art to cheer themselves up and take their minds away from the cancer and the treatments. On days when I lack motivation, emails like these remind me of why I create my mini pieces. Above: A tiny fairy represents Rebecca’s more whimsical work. Wow, what terrific endorsements! It must feel great to know your art is helping others heal. In fact, you’ve said that your own serious illness led you to work on the small scale. Could you share anything about your health situation and how it changed your art and process? In 2012, I found out I had glaucoma. I was only thirty-seven and went into a bit of a depression. I am a glass-half-full type of person and tell my children (three girls and three boys) that there is ALWAYS a solution to a problem and never to give up. 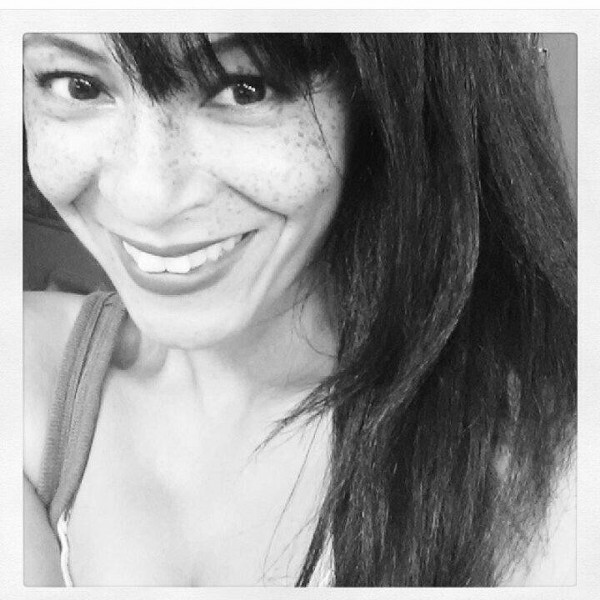 There is good in any kind of situation if you just look for it … but back when I was first diagnosed, I was finding it hard to accept my own advice. A ship sails toward a gothic castle in one of the interviewer’s favorite pieces, enlarged here to show detail. The small black cat is one of Rebecca’s signature details. This painting is actually 1.5 by 2 inches. Eventually I did some research and found that I may never lose my sight from glaucoma if I use eye drops daily and keep regular appointments with doctors. I decided that worrying was not going to help and I would challenge myself to paint every day, as much as I could, while I could still see. To this day I have created over eight thousand minis! I was told I had three different types of cataracts. They diminished my sight so badly that I was almost legally blind in my left eye. So this year I told my eye doctor I would have to go ahead and have surgery. I had my left eye done on October 29 [Editors’ note: that was just two weeks before this interview]. My right eye is not as bad, so I am waiting to get surgery in December. The surgery improved my sight greatly. After I had it, I looked at my paintings and wondered how I had ever been able to paint such detail without being able to see clearly. I spent ages afterward just looking at the tiny details in my own work. It was as if I were seeing it for the first time. Many people reading this interview are artists themselves. Do you have any advice for someone who’s aspiring? Anything you wish someone had told you (or that someone did tell you) long ago? My tip would be to communicate with and learn from other artists. You learn so much when you see others as a learning tool and not competition. 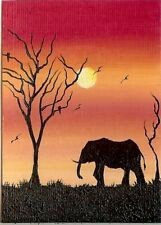 One of a series depicting large African animals. What do you admire most in the work of some of your favorite painters? Oh, goodness, there are so many famous artists who have inspired me — and so many artists I have come to know through social media who have inspired me. Growing up, I was obsessed with the realistic countrysides of John Constable. I loved his landscapes and tried to recreate the same detail in my own work. A palm-sized scene Constable himself would have loved. For a while I really enjoyed colored pencil and pencil-detailed artworks. I moved on to M. C. Escher (I loved his optical illusion works) and Salvador Dalí. Their work is quite different from mine, but I found myself very interested in theirs and enjoyed reading about them. I wouldn’t be surprised to learn they were fans of your work too. Thank you for the interview, Rebecca! 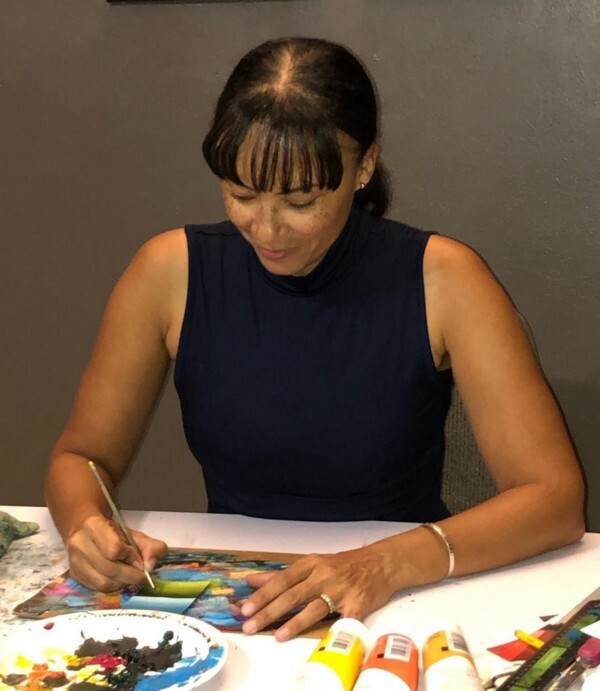 Connect with Rebecca and find out more about her art, life, and process via Twitter, Facebook, and eBay. Previous postFrom Our Pages: "The Body, in Parts," by Valley Haggard, with two paintings. Next postFamily Laundry: “Half-Naked Woman Found Dead,” by Luanne Castle.